The Mac user without task management software has no one to blame but himself. The Mac App Store alone lists over 150 products when searching on the word “task.” If you don’t have the time to try them all, put Firetask (Mac App Store link) on your short list. Version 3 of Firetask is a clean, capable task management program built around the Getting Things Done (GTD) methodology. But you needn’t be a GTD adherent to find the value in Firetask. The Firetask window is arranged in the familiar two-pane design popularized by iTunes. Task groupings appear along a narrow left column and include the In-Tray, four Foci that display work in progress, and groups entitled Review and More. Select a grouping and the affiliated tasks are listed in the larger pane to the right. A toolbar across the top offers buttons for many common actions like creating a new task or opening an information palette. Task management software is inherently information dense, and Firetask’s design manages to convey a host of salient data without overwhelming the senses. 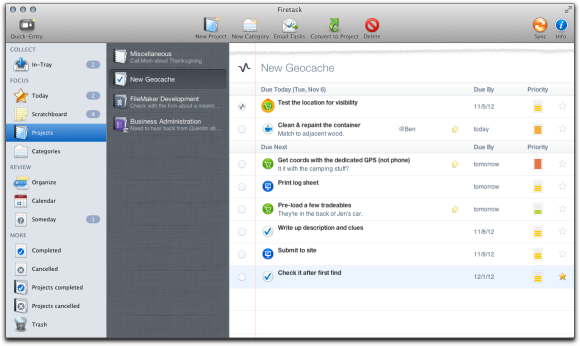 Firetask’s pleasing design and tight feature set ease the drudgery of task management. Individual tasks are the meat of any list manager. Any given task should be concise and easy to understand at a glance, but include enough meta-information to give it proper context and significance. Firetask’s designers have approached this challenge thoughtfully. Each task must have a subject and be assigned to a project. Default priority and category settings can be modified. The due date and notes fields are optioal. A field for assigning the task to a person is present, but can only me modified when the task’s category is set to “Waiting For”. Compared to Things’ ( ) relatively Spartan offerings and Organize’s ( ) profusion, Firetask has found the meta-data butter zone. Projects are the second crucial entity in Firetask and they’re not optional; each task must be assigned to a project. Firetask comes with a catch-all project called Miscellaneous already set up and, acknowledging that projects are sometimes borne of tasks, a Convert to Project button in the toolbar will take the selected task and do just that. Projects have their own meta-data that is similar to, but independent of, their constituent tasks. Clicking the Projects focus in Firetask’s left column lists all your active projects. Click one of those and its tasks appear. New tasks created here are automatically associated with the selected project and existing tasks can be reassigned via drag and drop. The third pillar of Firetask is the category, a simple but powerful way to contextualize tasks that go together in ways that transcend projects. Each category is a one word descriptor with a distinct icon. Freshly installed, Firetask’s thirteen categories include choices like Ideas, Calls, and Errands. When creating a custom category you can name it whatever you like, but you must choose its icon from the 31 provided. Taking a moment to assign each task an appropriate category can pay productivity dividends. Clicking the Categories focus gives you access to your tasks grouped by category regardless of project. This allows you easily pull up a list of, say, email tasks when plopping down at your desk. 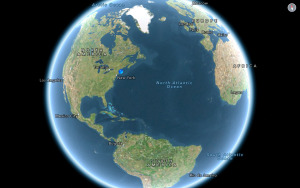 Users of Firetask’s companion iOS products can sync with their Macs then review the Errand category while out shopping. Firetask also contains a focus called Today where the most urgent tasks appear and a focus called Scratchboard for tasks that are still being crafted. An In-Tray at the top left lists all tasks with the status of the same name. It’s also the default landing place for items created via Firetask’s quick entry window- a floating window summoned by a system-wide shortcut. If Firetask has a sleeper feature, it’s got to be the way you can configure almost all of a new task’s options right in the subject line. With a little study and, dare I suggest an affinity for hyper-efficiency, you can instruct Firetask to assign the category, due date, flag, priority and project to a task without touching the mouse. Typing “Call Mom #miscellaneous #calls” would create a task entitled Call Mom in the Miscellaneous project with the Calls category. Firetask’s faults are minor, but I would like to see the ability to assign people to tasks even when the category isn’t waiting. No provision for importing means switching from your existing task manager requires re-entering everything. On two occasions, the drop-down calendar failed to close after setting a date and quitting the application was the only way to clear it. Firetask 3.0 is a well-designed and executed task manager with nearly all of the right features and zero bloat. Whether or not the letters GTD mean anything to you, if you’re serious about taming your to-do list Firetask is well worth your consideration.